We are currently supplying the main Mechanical and Electrical contractor, see which plane they are working around as it will remain in place during the refurbishment. 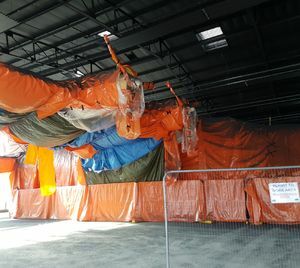 We are currently supplying the main Mechanical and Electrical contractor at RAF Hendon, where they are installing all the M&E as part of the museums refurbishment of their Hangar 1. All the contractors on site are having to work around the resident Short S.25 Sunderland (a flying boat patrol bomber) which is remaining in place during the course of the refurbishment as it was too fragile to be moved. A new industrial door will enable future access for other larger aircraft. The new Hangar 1 will be transformed into two new exhibitions. Foremost will be the ‘First 100 Year of the RAF’ display – focusing on the people of the RAF through its lifetime. The second has a working title ‘Now and the Future’, and will be a place where people can look at what the next stages for the RAF are.